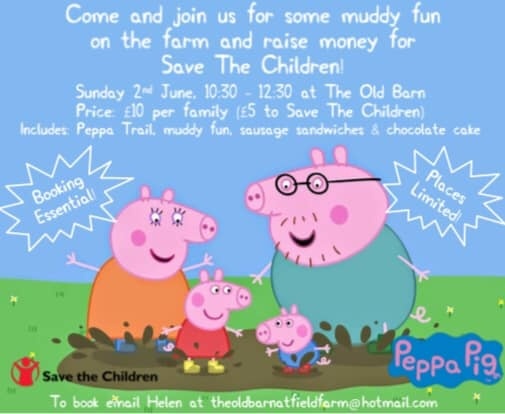 We’re raising money for Save The Children by hosting a Peppa Pig Muddy Puddle Walk at Field Farm in Rolleston. Tickets cost £10 per family which includes a £5 donation to Save The Children. Included in the ticket price is a light brunch of a sausage sandwich (vegetarian alternative available!) followed by Peppa’s favourite - chocolate cake!! There will be some fun themed activities for the children. Numbers are restricted so register early via email to Helen at theoldbarnatfieldfarm@hotmail.com. Don’t forget your wellies! !